In the sports arena, a yellow flag indicates pre-caution when proceeding – a red flag precludes further action…stop! Fairly basic and common symptoms might have more serious underpinnings. 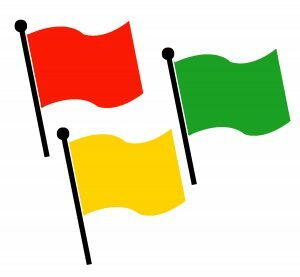 It’s important to attach additional questions to any yellow flags – including pain – that present themselves, and identify red flags that may require immediate medical attention. Since (manual therapists) are now ‘first contact’ clinicians, we have assumed greater responsibilities. While those interested in manipulation and allied treatments energetically improve their competence in the various techniques and applications, we might profitably spend a little time considering what we are doing all this for…. Pain distribution might confuse unwary or overconfident therapists, who may assume familiarity with a syndrome they recognize and then perhaps find themselves confronting the tip of a very different kind of iceberg. Martha Costello reiterates the importance of rigorous screening in the case history. Bodyworkers should be cautioned—often, when a patient has seen a medical professional prior to consultation with the bodyworker, it is assumed that all organic or pathological causes for symptoms have been ruled out. Are you using your case history as a tool to reduce risk of harm? Would you like to build more competence in this skill? 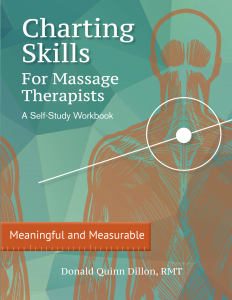 Have a look at the Charting Skills for Massage Therapists program. CEUs have been granted in NFLD/LAB, PEI, NS, NB, ON, MB and SK, with others pending.